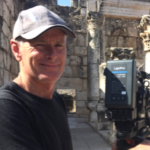 Mick is a Director of Photography with a portfolio of work ranging from documentaries filmed in the slums of India and iconic locations throughout Australia, the US, UK and the Middle East. He shoots television commercials, international formats and television series’ broadcast around the world, as well short and feature films, and has filmed with a Hollywood A-lister. Credits include Trust (feature film), Everytown Downunder (travel series), Taste of Australia with Lyndey Milan (food series), Let Hope Rise (feature documentary), John Wesley: The man and his mission (feature documentary), and Trinney and Susannah (British fashion/makeover series).